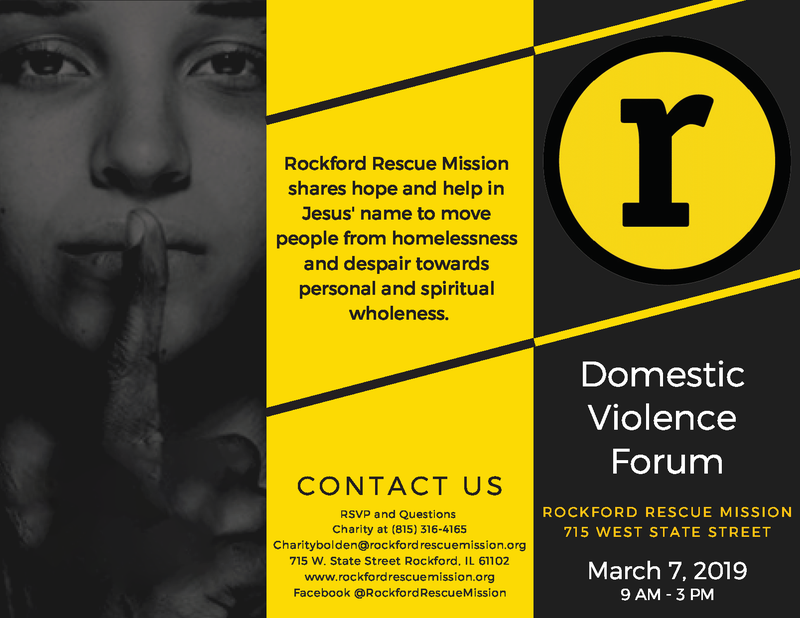 Join us at the Rockford Rescue Mission for our Domestic Violence Forum on March 7th from 9AM-3PM. 44% of the women staying at Rockford Rescue Mission’s Women’s Crisis Center report needing shelter due to Domestic Violence and Relationship Conflicts. Pastors and ministry leaders can feel very much alone and ill-equipped when dealing with such horrific problems in the lives of those whom we care about and are called to protect. But we are not alone and God has equipped us. God has also established the authorities to partner with us to see that both justice and healing are carried out. Our agenda for the day will include sessions on Understanding the complexities of Domestic Abuse, Addressing Survivors of Domestic Abuse, and Addressing Those Who Perpetrate Abuse as well as presentations from RAASE/Mayor’s Office of Domestic Violence and Human Trafficking Prevention. Stacey Womack, founder and Executive Director of Abuse Recovery Ministry & Services (ARMS) will also be sharing at our forum. Stacey has served survivors of domestic violence through women’s victim recovery classes which are offered across the US, Kenya and Mexico. Along with writing and developing these classes for women, Stacey also writes, develops and co-facilitates ARMS faith-based batterer intervention programs for men. She will share about Domestic Abuse and how churches, ministers, and local community leaders can radically change how they minister and outreach to those experiencing and inflicting abuse. Registration for this event is free and a pre-paid lunch special is available through the Restoration Cafe. All lunch options are $10.00. To register, please print and completely fill out the second page of this form and mail to the Rockford Rescue Mission by February 22, 2019.